By following the British cooperation programs, advanced warships such as the Fusō, Kongō and Hiei were built in British shipyards specifically for the Imperial Japanese Navy. In 1883, two large warships were ordered from British shipyards. The Naniwa and Takachiho were 3,650 ton ships. The naval architect Sasō Sachū designed these on the line of the Elswick class of protected cruisers but with superior specifications.An arms race was taking place with China however, who equipped herself with two 7,335 ton German-built battleships (Ting Yüan and Chen-Yüan). 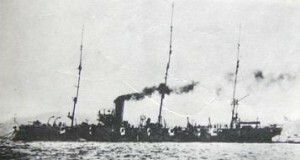 Unable to confront the Chinese fleet with only two modern cruisers, Japan resorted to French assistance to build a large, modern fleet which could prevail in the upcoming conflict. This is referred as the influence of the French “Jeune École” (1880s). The French doctrine was favoring small, fast warships, especially cruisers and torpedo boats, against bigger units. The decision to be closer to France was based on the fact that Japan was uneasy with being dependent on Great Britain, at a time when Great Britain was very close to China. The Meiji government issued its First Naval Expansion bill in 1882, requiring the construction of 48 warships, of which 22 were to be torpedo boats. The naval successes of the French Navy against China in the Sino-French War of 1883–85 seemed to validate the potential of torpedo boats, an approach which was also attractive to the limited resources of Japan. In 1885, the new Navy slogan became Kaikoku Nippon (Jp:海国日本, lit. “Maritime Japan”). This period also allowed Japan “to embrace the revolutionary new technologies embodied in torpedoes, torpedo-boats and mines, of which the French at the time were probably the world’s best exponents”. Japan acquired its first torpedoes in 1884, and established a “Torpedo Training Center” at Yokosuka in 1886. Chiyoda (千代田) was a protected cruiser of the Imperial Japanese Navy, which served in the First Sino-Japanese War, Russo-Japanese War and World War I.